MORGANTOWN, W.Va. - Over the past few decades, the City of Pittsburgh has become “a model of Rust Belt revitalization,” and its revival, in large part, is due to the preservation and management of parks systems. West Virginia University will provide an opportunity for students and community members to learn valuable lessons from one of Pittsburgh’s distinguished environmental designers, who has been a key player in the city’s reinvention. Susan Rademacher, parks curator for the Pittsburgh Parks Conservancy, will serve as speaker for this year’s E. Lynn Miller Lecture at 2 p.m. Wednesday, April 26, in Ballroom B of the Erickson Alumni Center. Remember the first time you saw a cow up close or heard the baa of a sheep in person? Thousands of area kids will experience those firsts when West Virginia University’s Animal Sciences Farm hosts Kiddie Days April 25-27. It’s an unseasonably warm February day in Morgantown, but a cool breeze is moving through a wooded valley tucked away in West Virginia University’s downtown area. 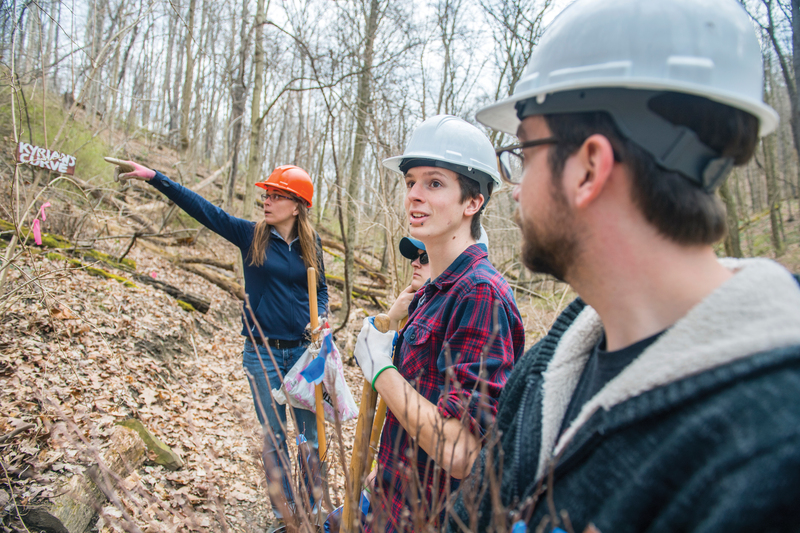 At the end of Outlook Street, less than one-half mile from the Mountainlair student union, Vaike Haas, assistant professor of landscape architecture, and a group of her students are taking advantage of the nice weather to work on a project near and dear to her heart. Lisa Orr's lifelong fascination with Appalachia's rural cemeteries began when she was just 11 years old during a visit with her family to the rolling hills of Preston County, where she attended the funeral of her great-grandmother. She was inspired so much that this topic became a life-long-learning pursuit, becoming the subject of her research in graduate school at the University of California at Berkeley and continuing at WVU, where she serves as assistant professor of landscape architecture. This month, Orr's years of research and dedicated work are being highlighted in a feature piece titled "Request Not Found" in a premier publication for landscape architecture, Landscape Architecture Magazine. James Thompson, professor of soil science, is one of six West Virginia University faculty members to be selected for the 2017 Foundation Award for Outstanding Teaching. On April 9-13, West Virginia University scholars will join other experts in the fields of mining and reclamation for a joint conference of three prominent organizations. Members of the American Society of Mining and Reclamation, the Appalachian Regional Reforestation Initiative, and the West Virginia Mine Drainage Task Force will gather at the Waterfront Place Hotel for the four-day event.